Published in Vines (https://hedgerowpoems.files.wordpress.com/2018/03/vines-live.pdf), 3/2/18. Jeff Streeby, Wile: Sketches from Nature, Great Falls, MT: Buttonhole Press, 2017, 48pp. Suggested donation: $15 for limited print edition. Free e-book also available. Both can be obtained at Jeff Streeby’s Website. Wile, a collection of haibun by poet Jeff Streeby, contains 27 short pieces that run a page or two each — concentrated, but not abbreviated. Each haibun tells a complete little story, a window into a man’s life that has been lived in close contact with nature (and human nature). Trapping is the main thread that runs through this book, and the terrain spans the once-Wild West and reaches up into Alaska. By the end of Wile, readers will know a good deal about types of traps — blind set, flat set, walk-through, step-down, castor mound, and others — and how to lay them, as well as something of the animals who meet their ends there. Readers will gain insights into the ways of coyote, bobcat, fox, raccoon, mink, muskrat, and beaver. The acts of trapping in the book, whether for wildlife management or pelts, exhibit no malice but do display plenty of cold cunning. Prey is viewed with detachment and a certain grim humor, and the scenes the author sketches, whether majestic or intimate, use a measure of grittiness both to dull the edge of beauty and to polish it. But the descriptions are neither grisly nor gratuitous; this is artful writing, not a horror show. Trapping animals is only half the story, though. Trap-related haibun alternate with a variety of other experiences: visits to a 19th-century pioneer farm site in Iowa and an overgrown riverside holding in Michigan, driving a big rig through flash floods and blizzards, observing winter in Potawotamie country and spring in the land of the Ottawa, and acting as a bouncer at a cowboy bar, to name a few.
. . . these veils of cool fog wearing thin, tattering, the dew beading on the dogwood, the fox sedge, the winterberry. A profusion of fragrances drawing out the early bees who hum now among the alexanders and the meadow rue. A red squirrel chittering in the top of the one black walnut tree. My Banty rooster from his perch in the chicken coop is calling the sun up out of the dark again. In the next breath, he will praise himself according to his excellent greatness for the daily success of this most mighty act. With the same song, different verse, two strutting turkey toms chant his descant from the brush down by the river. Like his prose, many of the author’s haiku also capture the wonder of the natural world. They range from the musical (using assonance, consonance, and internal rhyme) . . . The willow killer . . .
. . . to the strongly sensory . . .
Whitetail season . 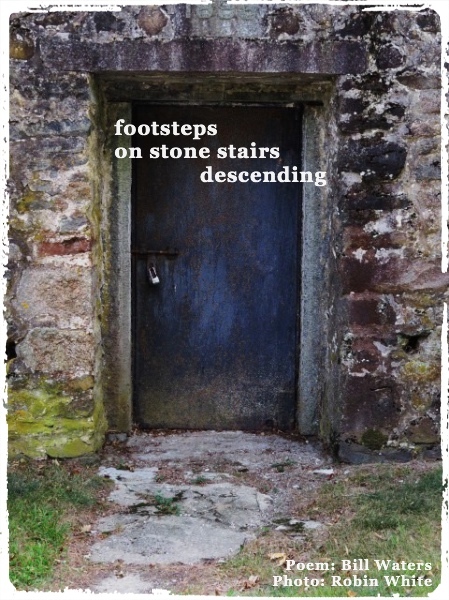 . .
Time spent with this intriguing collection of haibun is like a visit with a fascinating, somewhat world-weary uncle who has lived close to the land he loves and is as contemplative as he is knowledgeable. Published in Haibun Today: A Haibun and Tanka-Prose Journal (http://haibuntoday.com/ht121/Articles_Waters_Streeby.html), 3/1/18.